Monday evening, the Blackhawks were down 2-1. They were playing game six of the Stanley Cup Series and their play appeared lackluster. Game seven seemed inevitable; at least it would be at home. We decided that rather than stay inside the house to watch, we would sit outside by a fire and listen to the game on the radio. The advantage to the radio is we would be listening to the hometown call and the announcers would be on our side. We left the TV on in the house so we could step inside should anything of interest occur. The game was almost over when my husband went in for a glass of wine. From outside I heard him holler and whoop with elation. The Blackhawks had scored! The series was headed for yet a third overtime game. But, wait…seventeen seconds after that goal, they scored again! I have to admit, I missed this just trying to get into the house. It turns out that since we were listening to the radio over the internet, there was quite a delay. By the time I got in, they had already scored that second goal and with less than a minute to go, the win was all but certain. We were too excited to sit down as we watched them skate to victory! The after-game festivities were a joy to see. The traditional handshake the teams shared was heartwarming. We watched each of the Blackhawks skate around with elation, the Stanley Cup raised over his head. Neighbors set off fireworks. Caught up in the moment, we decided (at 10:30 at night) to run to our local sporting goods store to get our own Blackhawk Stanley Cup Champions gear. We called and they would be open until 1:00 am. As we drove, the roads were filled with happy Blackhawks fans. Horns honked and people cheered. Many cars were filled with fans sporting Blackhawks sweaters. When we pulled into the parking lot, it looked like Black Friday or the Saturday before Christmas. The store was jam packed, but it was a jovial crowd. There were tables filled with gear and long lines to even see what they had. I picked up the first two hats I found; I figured I could put them back if I found something else. I knew the stock would go fast and I sure didn’t want to go home empty handed. Even with the crowds, people were polite and there was no pushing or grabbing. It may have been a mob, but it was a friendly one! The line ran halfway around the store and when we got home it was 11:30. By the time we settled down enough to go to sleep, it was well after midnight. We both had early starts the next morning but we have no regrets. 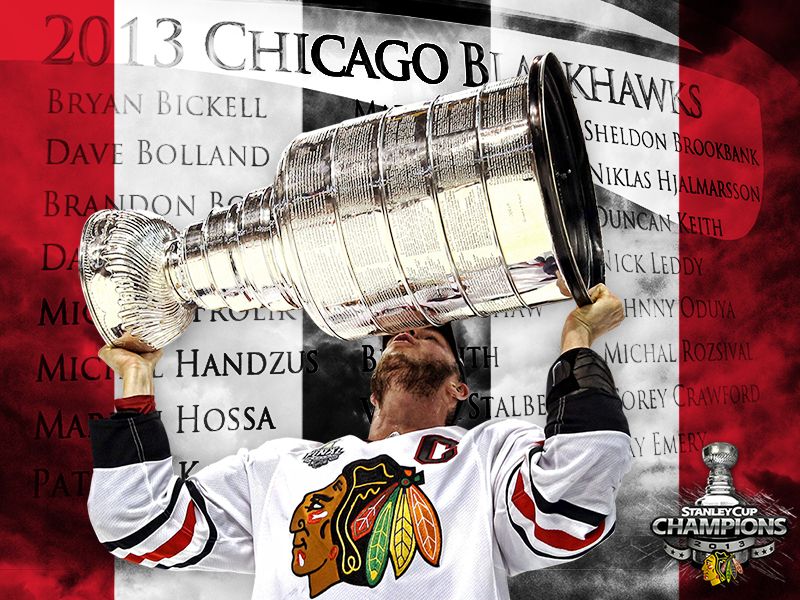 It was a great night for Blackhawks fans! This entry was posted in Home, Memories, Sports. Bookmark the permalink.